I remember the show but not as well as I remember Muppet Babies! i love fozzie! i remember having a stuffed, possibly muppet baby, version from mcdonald's. The kids watched The Muppet Show, but I don't think we ever had any of the characters. However, I still have a number of characters from Sesame Street. As a kid I don't remember being attached to any one particular Muppet, though as I grew older and became fond of pigs I re-discovered Miss Piggy, of course. I had a Fozzie Bear, too! He was definitely one of my favorite Muppets. Ally, aw. That is so cute. I am a huge Muppet Show fan. I have the first three seasons on DVD and really wish Disney would get on the stick and release more of them. Maybe with the new movie coming in November they'll kick in the marketing machine and give us a couple more. Great stuff. Fozzie was fantastic, but Miss Piggy was my favorite. It was something about her attitude, I think. I remember watching The Muppet Show on occasion, but The Muppet Babies were a staple on my TV growing up. Most of my experience with the Muppets were Muppet Babies as well now that I think about it. 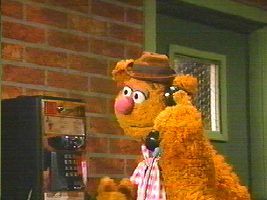 No doubt about it; Fozzie was the coolest muppet.